The labels are sharp and the correct colour which is shown clearly in the photos below. The labels list the tracks, title and the release date: 5th Dec. Unlike fake copies, there is no label underneath. Further authentication comes from the 1/G, 1/G stampers indicating that it was one of the first pressed. 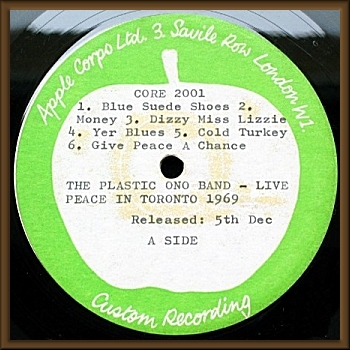 (The stamper letter 'G' can just be seen in the upper right corner in the photo of the side 1 label ). There is no cover supplied with this disc. Both labels are still firmly stuck down and have no other marking on them apart from some glue staining coming from the underside. The surfaces are very bright and clean with side 1 showing just a few light non-feelable/non-audible thin surface marks. 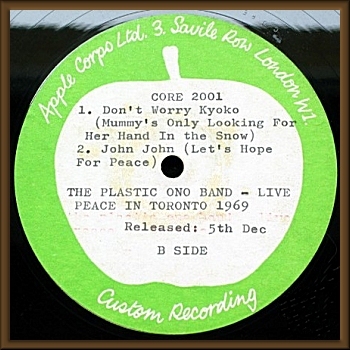 Side 2 displays some light marks from inner-sleeve storage but there are no deep marks or major faults anywhere. 100% flat on the turntable without any dishing or warping. This disc has been hardly played and the sound quality from this very first pressing is flat, clear and loud and undistorted by groovewear. Played very loudly few soft ticks are audible during one of Yoko's quiet moments but there no other audible faults whatsoever. All tracks play without distortion, hiss, crackle, clicks/pops, jumps or repeats.